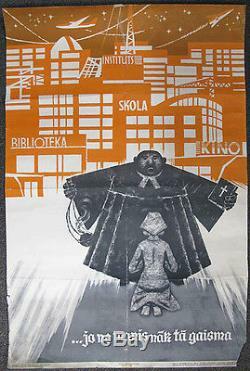 1963 Soviet Latvian USSR lithographic anti-religious propaganda poster. Jo no manis nak ta gaisma... Because of me comes the light. Design by: Berzin Color Lithography on paper Published in Latvia, USSR. 1963 -- guaranteed to be original and NOT a later reprint Size: 35 in x 23 in (90 cm x 59 cm) Condition: Very minor damage on margins, repaired tears, heavy fold lines. Unconditionally guaranteed to be genuine for life. The item "1963 VINTAGE RUSSIAN USSR LATVIA ANTI RELIGION RELIGIOUS PROPAGANDA POSTER" is in sale since Monday, July 1, 2013. This item is in the category "Art\Art Posters". The seller is "antiquisto" and is located in Boston. This item can be shipped worldwide.